We provide surgical facilities for both elective and emergency surgery. Our surgical suite incorporates eight major theatres, each with an anaesthetic room. We have a separate holding bay for pre-operative patients and a recovery room with nine fully-monitored bays. Our recovery room also provides recovery facilities for patients from other areas including Endoscopy, Radiology and Cardiac Catheter Laboratory. 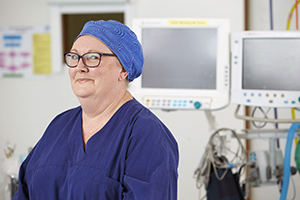 Our nursing workforce comprises a nursing coordinator, clinical nurse manager, clinical nurses, registered and enrolled nurses and staff development nurses.